Packaging Details Height Width Depth Weight 7.46" 2.97" 1.87" 9.2 oz. Details The world's most advanced fat loss formula. For rock hard abs and body. Proprietary formula also contains: » caffeine. » yohimbe. » forskolin. » usnic acid. You can lose over 2 inches in 3 weeks! Ab-Solution is the most advanced slamming and toning formula available today. Finally, there's a completely safe and effective way to achieve the firm toned look you've always wanted. 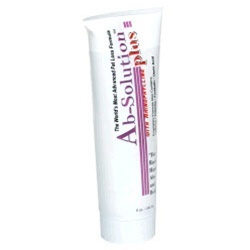 Ab-Solution Plus fat reduction formula reduces inches in the abdomen, hips and buttocks area. Results can be seen within weeks due to our liposome technology formula. Scientific studies proved that users reduce up to 14% of the fat layer from the stomach are and up to 15% from the arms in just 30 days and lost and average 2.1 inches per thigh is just 3 weeks. Ab-Solution Plus is safe, effective and contains alpha hydroxy acids, which help to make your skin smoother while toning your body. With patented Liposome technology. Directions Apply Ab-Solution Plus twice per day on the desired area. For best results, massage into the skin for 30-60 seconds, once in the morning and once in the early evening. after using Ab-Solution for 60 days, apply only once per day.